The held opening D sharp pedal in the double basses, soon repeated in triplets that are much later to become the basic three-crotchets-in-a-bar pulse of the Scherzo, is quietly surrounded by its two nearest neighbours, the semitones above and below it. The resulting shape, D sharp–D natural–E, is the germ from which everything in the Symphony grows. For instance, this shape gives rise to a particular feature of the language of the Ninth Symphony – central pedals to which are added, like barnacles to a ship’s hull, statements of the notes a semitone on either side of it. The first figure is the start of a ‘wedge’ shape, a process of fanning outwards from a central point: the upper part rises by a fourth while the lower drops a fifth. Both these intervals – particularly fourths – play a large part in the symphony. For instance, in the opening paragraph this ‘wedge’ already starts growing into new shapes, rising each time by a fourth with increased tension until all twelve pitches have been traversed; then the original D sharp is recovered. There are also clear beginnings of rising and falling scales that become important later: and at the second figure the implied harmony of a major third turning into a minor one by the process of shifting the bass up a semitone is an element of which much use is made. Against the steady unfolding of musical material, which includes the first of several fugatos in the symphony, the brass announces the ‘chorale’ in long notes, each phrase entering a fourth higher (or a fifth lower) than its predecessor. There is a combination here of epic grandeur of the Bach kind and logical symphonic growth of the type we associate with Beethoven. That same epic grandeur can also be found in Bruckner, another of Simpson’s abiding loves; indeed, towards the end of the opening chorale-prelude he pays musical homage by alluding to (though not quoting) him (see letter F in all editions of the first movement of Bruckner’s Third Symphony). The monolithic size of this chorale-prelude, with the in-built conflict of its double time-scale and the pent-up energy that it amasses, results in an extraordinary degree of tension and a great climax, which explodes into a fast Scherzo whose power and speed place it in the line of the great Beethoven Scherzi. The essence of this section is an outbreak of rampant energy, long pent up, and events fly by with exhilarating rapidity in an orchestral tour de force. The material is still based on the opening ‘wedge’; specifically, chords are built up (or rather, they are built down) by descending fourths, reversing the direction in the chorale-prelude. Eventually all twelve notes are sounding, and the resulting chords are contrasted strongly with straightforward diatonic triads in the horns and trumpets. The ‘wedge’ shape is then used on many planes, which also descend by fourths: the central pitch is sustained each time so that a chord is built gradually as each new plane of fourths is added. Each new tonal plane is a bar shorter than its predecessor, so giving a sense of unstoppable forward motion. The ‘wedge’ formation is omnipresent, and this accounts for the consistency of the movement: the rapidity of events makes detailed description impossible in a note such as this. A return to the ‘long-note’ ‘chorale’ writing recalls the pace of the first section, and makes it possible for the mind to relate the two. We might compare the processes to the foreground and background of a painting: in the chorale-prelude the slow motion fills the foreground, with fast triplets in the background. In the Scherzo the fast triplets take over the foregound; but the return of lines of the chorale begins to change the focus yet again. The process had been used by Sibelius in his Fifth Symphony, a work universally admired for its command of movement; Sibelius is another of those composers who meant much to Robert Simpson throughout his life. The second of the three great climaxes in the work results from this riot of activity and the conflict between the various levels of motion. Gradually the ‘long-note’ writing of the chorale takes over the foreground so that there is a feeling of ‘slowing down’ (even though the pulse does not change). 3/2 returns in a big striding passage that subsides mysteriously into the second phase of the work, an Adagio which begins with a fugue for strings alone, starting ethereally high up in the first violins. 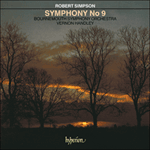 The enormous build-up of forward motion which the Scherzo has provided makes it possible for Simpson to continue in a quiet, slow vein for some time, the peace and beauty of this section balancing the tumultuous energy of the foregoing music. When the woodwind re-enters, it is to announce three widely spaced statements of a palindromic theme which builds upon the idea of retrogrades already suggested: in the theme the ‘wedge’ shape widens to an octave and shuts again. These palindromes loom mysteriously through the counterpoint, though after the third the music becomes livelier, moving into a pastoral passage full of woodwind twitterings. This rises in intensity until, after becoming menacing, it quietens again over a pedal E. In this massive ostinato-like decrescendo, the figuration attempts to fan outwards, only to be dragged inwards time and again by a centripetal pull, strings, oboes and flutes trying to break away from the pedal E.
For a while, quiet reminiscences of the chorale are heard: and the last palindrome, delivered loudly by the trombones, vividly recalls the style of the opening chorale-prelude. Its power gives rise to a gradual increase in tension: the triplet rhythms of the Scherzo are applied to a series of pedals which rise gradually by fourths, while against each pedal the opening ‘wedge’ is announced powerfully in dotted rhythms by the lower brass. The fast triplet foreground and the slower motion of the opening are now both in focus, and the combination makes for a passage of tremendous energy which works up to the third and last great climax of the work. Still the planes of rising fourths are evident; though by a touch of irony they now fall by fifths instead, a process made clear by the prominent F–E–C–B flat shape used (at appropriate pitches) at each change of plane. The final chord of this passage, which at first hearing one might easily take to be the end of the whole symphony, dissolves to leave a slow and quiet coda. This coda is based around the pitch E flat (later D sharp) – the pitch with which the symphony had opened. A series of statements of the opening ‘wedge’, almost sounding like another fugue, begins, with the tonal planes now descending (rather than ascending) by fourths. Rising scales are prominent; the final pedal E flat/D sharp sounds against one that reaches from low in the cellos and double basses to the extreme heights of the violins, seemingly passing out of time and into eternity. The D sharp, which had been low in the double basses at the start of the symphony, ends by being extremely high in the second violins. This symphony is not only a mighty study of musical motion, comparable to those we find in Beethoven and Sibelius: it is also a study of the power of a simple musical germ to generate enormous paragraphs of music. It is of immense directness and power, and enshrines all that is best in symphonic writing while still remaining completely unified and original. 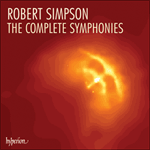 This symphony is a giant, written by a giant among symphonists.